Alternate string sets for the ukulele. The most common tuning today for soprano, concert and tenor ukes is C6 (g C E A) while the baritone has the G6 guitar tuning. (D G B E). Both of these are sometimes made into the Taropatch open tuning by lowering the 1st string one whole step. The open tuning with a high 4th string is a good choice for both fingerpicking and clawhammer. The low 4th string is good for fingerpicking and strumming. The normal high 4th string on 4 strings are used for strumming, fingerpicking and clawhammer. 6 string ukes can be played strummed or fingerpicked. 8 strings ukes usually are only used for strumming. For the remainder of this post we will discuss alternate string sets maintaining the 6th chord tunings.These strings are sometimes available as a set or as individual or extra strings. First we have the low G (G C E A) strings on a Mainland all solid concert mahogany pineapple with a long neck (tenor size). This uke has very attractive rope binding around the head stock, sound hole and body, it sounds and plays great. Next we have a G6 set of strings (d G B E) on a Kala Tenor with a solid spruce top and laminated spalted maple back and sides. The higher pitched 4th string on the smaller body size make it sound quite different from a baritone. The lower pitched strings also are very different from the normal C6 tenors. The G6 set has a nice mellow tone and it is a favorite of Hawaiians and Jim Beloff for his Martin tenor according to his first video. Next is a No-Name solid mahogany Baritone from eBay with a set of C6 strings (g C E A). Nice dolphin inlay and a very mellow sound due to the larger body when compared to smaller ukes. The Mele all solid Koa tenor 8 string has a very full sound like a 12 string guitar. It strings are C6 tuning (gG cC EE AA) Perfect for strumming. When I bought the Mele solid mahogany double puka tenor it was tuned g cC E AA. I changed the 2nd A string to be an octave lower for a very different sound. For my birthday I just received the new for 2015 Kala 5 String Tenor Uke with a solid cedar top and laminate acacia back and sides. The fourth course has both high G and low G strings. In 1919 the C.F. Martin company began manufacturing Tiples. 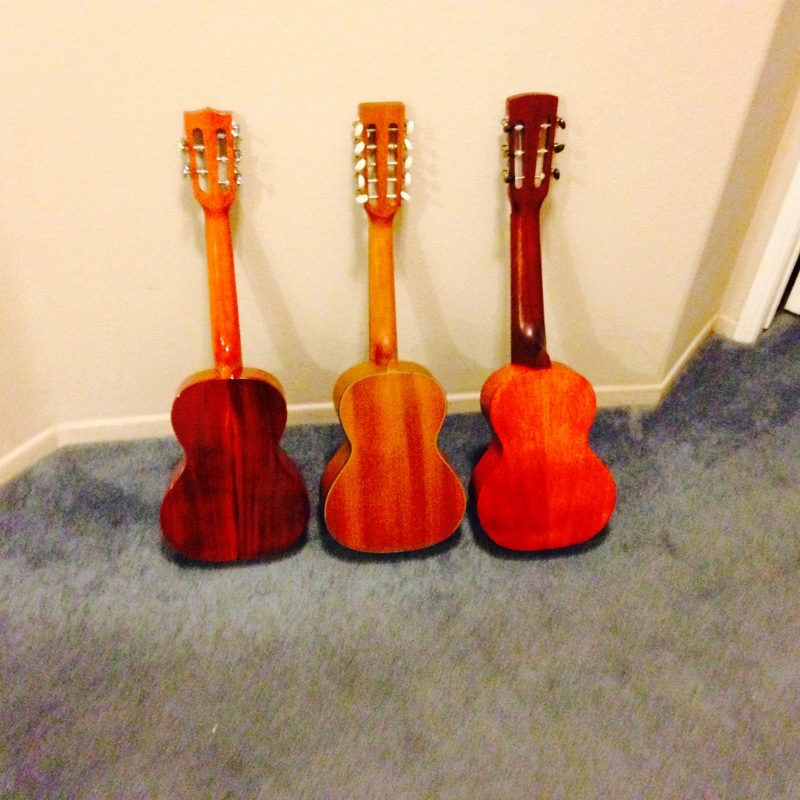 These were modeled after South American Tiples and Hawaiian Ukuleles. The instrument had 10 steel string in 4 courses tuned like D6 ukuleles. Today Ohana builds tiples based on the old Martins. Mine is tenor size and has a solid mahogany top, back and sides. It is tuned gG cCc eEe AA. There are a number of youTube videos of people playing the American (Martin) style tiples as well as various South American models. In the 1920s The Golden Melody Boys released a number of records featuring the tiple in the Paramount Old Time Catalog. Today's new Golden Age of the Ukulele has shown us many new models of ukuleles including the Gretsch Guitalele. It is tenor size and it has a solid mahogany top and laminated mahogany back and sides with nylon strings. It is tuned A D G C E A (like a guitar with a capo on the 5th fret). There are many youTube examples of various ukulele strums. Aaron Keim has a good number of excellent examples of both fingerpicking and clawhammer ukulele playing.